The picture reflects the different ways this material looks when layered. 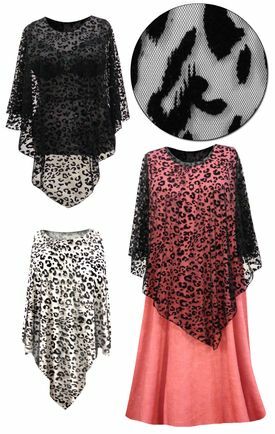 These are beautiful elegant plus size - supersize ponchos in a black velvet leopard spots pattern. The fabric is a transparent lace, meaning you can completely see through the lace. For this particular garment, plan on wearing an outfit underneath it. This will look stunning over a dress or swimsuit.